Day 15 -- Can I See Yet? Day 15 — Can I See Yet? Another day of quiet growth… up to 21.2 oz at 8:15 am. Here’s MUNI in the brighter kitchen lights at 8:15 am. Click for a larger version! We checked for eyes in the morning, and there were none. But then, at 9:30 pm, Geoffrey looked into MUNI’s eyes for the first time. Yay! 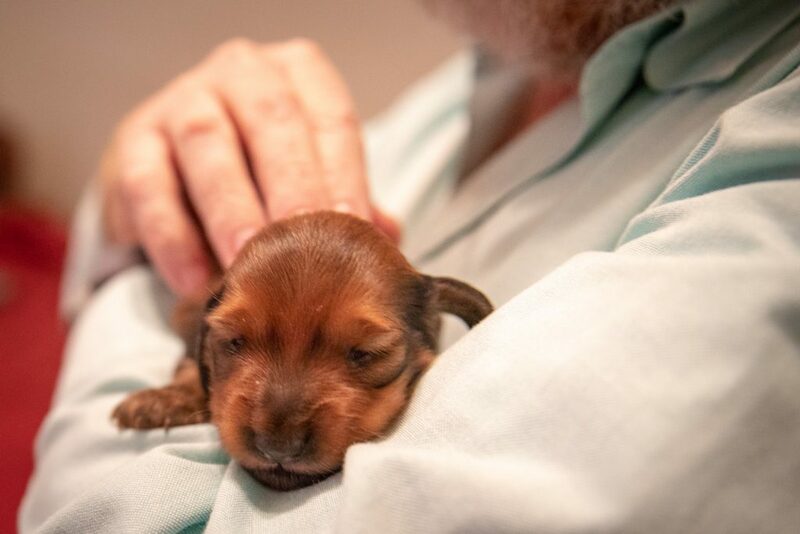 This entry was posted in dachshunds and tagged dachshunds, MUNI, puppies2018, zenith puppies. Bookmark the permalink. 1 Response to Day 15 — Can I See Yet?